Bushwick residents gathered at MayDay Space to talk about displacement and share their fears. Ariella Riapos doesn’t believe anyone in Bushwick should wait and certainly doesn’t think anyone should bother seeing any proposal to rezone Bushwick. The charismatic Pace graduate who wore a black t-shirt that reads “Brooklyn Is Not For Sale,” Riapos is a founding member of an anti-gentrification group called G-REBLS and has been among those leading the effort to organize in advance of and largely against the release of the Bushwick Community Plan, a rezoning project that has been four years in the making. She is against any measure that involves rezoning the neighborhood. “The moment we let the city start rezoning Bushwick, we lose,” she told Bushwick Daily. 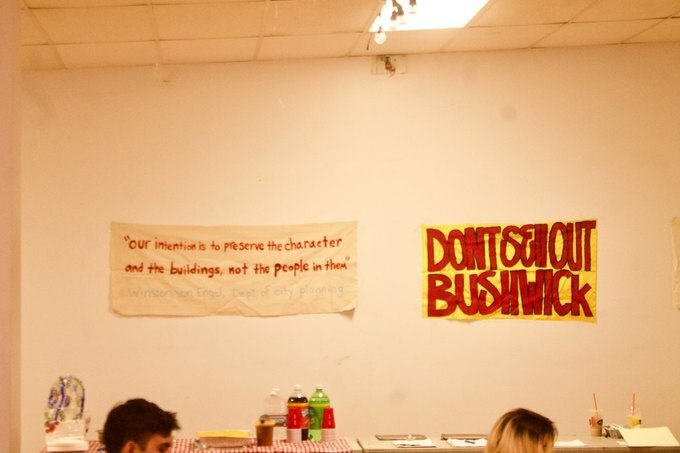 Riapos was one of the organizers of a town hall held this weekend in order to push discussion of the Bushwick Community Plan. 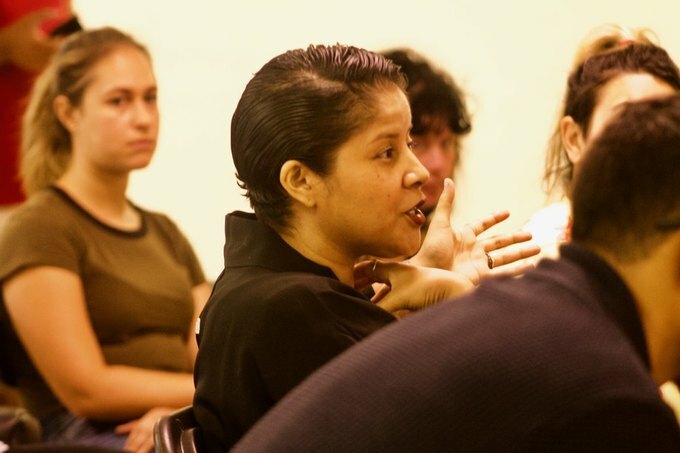 She was joined by fellow G-REBLS founding member Malik as well as Bruno Garcia, a tenant organizer and member of the Steering Committee for the Bushwick Community Plan, though he largely opposes it and says he believes the city cannot build itself out of larger issues the community faces. The plan, Riapos and her colleagues believe, is being slipped past the community it will affect. She asked the thirty or so people gathered Mayday Space, an organizing center on St. Nicholas Avenue, if they were aware that a major effort is being done to rezone Bushwick. Two or three raised their hands. The Bushwick Community Plan will be released in its official form to the public on September 22nd, but there is already some understanding of what it will entail. 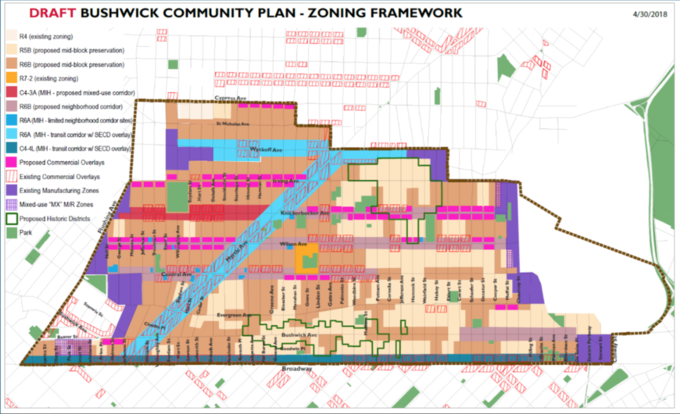 Garcia presented a map of the neighborhood that is populated with some ten or twenty different colors, representing what a potentially rezoned Bushwick will look like. The long and short of it is this: vast chasms of industrial space rezoned into residential space, where developers can snap it up. The claim of the Committee is that this kind of change is ultimately unstoppable so it can be mitigated instead. This map was not used at the meeting, It is from the city's online section on Bushwick rezoning. The city will rezone Bushwick anyway, so long time residents and advocacy groups want it to happen on their terms. The proposed terms include: promised downzoning of unclearly zoned areas, where so-called “middle finger” high rises have already been erected. There’s also a promise of “affordable housing,” the definition of which Riapos and her colleagues challenge, claiming that the city calculates such things, affordability would be based on an income above $70,000. The plan also proposes new schools, new infrastructure, and so on, mainly promised by Winston von Engel, director of the Department of City Planning’s Brooklyn office. Engel has quickly become gentrification’s Robert Moses, whose name has already taken on a similarly villainous quality. 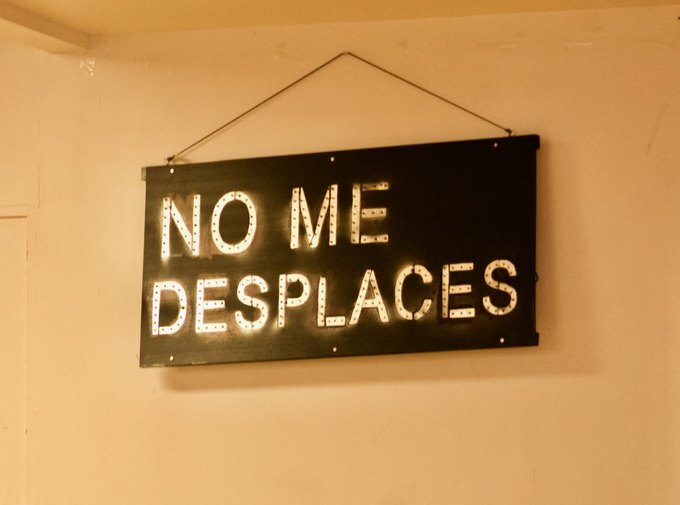 On the Instagram page for Mi Casa No Es Su Casa, an anti-gentrification art collective who also helped organize the town hall, you can find a meme-styled caricature of Engel, in front of buildings with dollar signs over his eyes. One of the first things that Riapos did when she arrived to set up chairs for the town hall was to hang up a piece of canvas with his name on it. It quotes him: “Our intention is to preserve the character and the buildings, not the people in them.” The line comes from a meeting earlier this year between DCP officials and drafters of the Bushwick Community Plan. Like Riapos, he is dubious of the Bushwick Community Plan and told Bushwick Daily that “REBNY is the source of all corruption in this city and I don’t think anyone can trust anything they get their hands on won’t be corrupted,” referring to the Real Estate Board of New York, a trade organization of real estate honchos. Eisenbach handed out fliers where he promised to be “the only candidate with [sic] Plan to Stop Predatory Rezoning.” He promises to do so by appointing an “Anti-Rezoning Activist” to the City Planning Commission and banning campaign contributions from developers. Eisenbach sat in the first row next to other eager students: Councilman Antonio Reynoso, who stayed largely silent when the town hall began and is among those who support rezoning measures. Alicia Boyd, founder of Movement to Protect the People, also attended. She’s a veteran of the largely successful anti-rezoning campaign in Crown Heights and Flatbush. She is also dubious of the promises of the Bushwick Community Plan. Paranoia permeated the room. Neighborhoods like Williamsburg, Harlem and Gowanus were referred to like diseased colleagues in the wake of a coming plague. Garcia mentions held suspicions that Bushwick had been zoned improperly to begin with, in order to create exactly this conundrum. Quiara Z. Escobar, a school teacher who has lived in nearby Ridgewood for 46 years, says she receives phone calls from numbers she can’t call back that urge her to leave. New bars have been built near her home that keep her awake late at night, and she doesn’t care for these new neighbors. “They don’t want to interact,” she says. Robert Camacho, a retiree recently made chairman of Brooklyn Community Board 4, turns the blame toward the steering committee and his own fellow Board members. He accused them of rejecting his concerns, which he says he raised since day one. This turned into an impassioned speech, which he delivered with aplomb, his body catorting and his fists shaking at a pestilence that is omnipresent and refuses leave. “We are getting pushed out. My people are getting displaced,” he said. 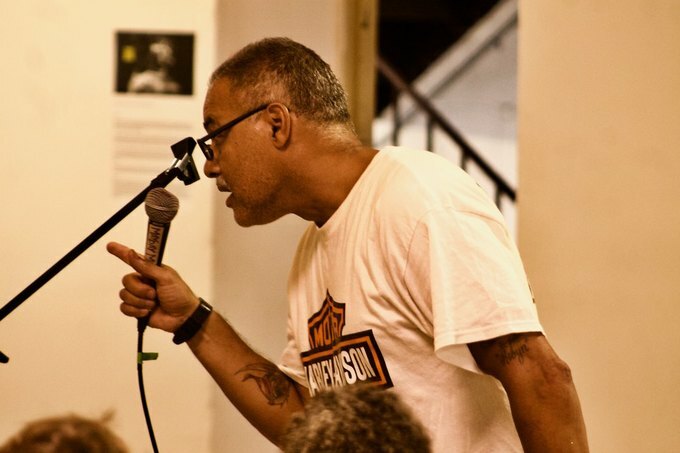 Anti-gentrification activism will continue this weekend at the Brooklyn March against Gentrification, Racism & Police Violence, which will begin Saturday morning in Prospect Lefferts Gardens and Crown Heights.